This homemade Country Burger is guaranteed to be the star at any BBQ this Summer ! No barbecue is completed without a proper burger. 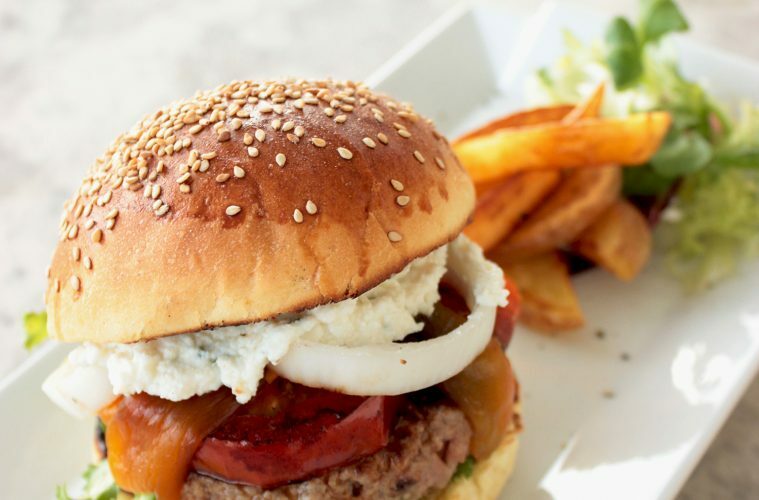 The Country Burger recipe brings together all the key ingredients for the perfect Summer hamburger : delicious brioche bread, healthy and flavorful toppings and of course a burger cooked to perfection. Everything starts with the bun, whether you make your own brioche bun or buy from your favorite baker, choose a soft compliant brioche. Brush both side with Extravirgin olive oil and gently toast them until lightly crisp. For any burger that screams DELICIOUS the biggest secret is the meat. Choose good quality 80% lean minced beef steak, season with just salt & pepper beforehand, so that the meat will stay juicier while cooking. Don’t over mix the meat, equally divide to form 6oz patties, and refrigerate for at lest 1h. TIP: Gently press your thumb in the center of each patty before grilling, this way the meat will retain its perfect burger shape. Place the patties on a med-hot sizzling pan/grill, and for the perfect medium-burger cook the meat 5 mins on one side and 2 mins on the other. Never turn your burger more than once, allow the meat to caramelize and release its fats, then just flip it on the other side. With all the basics done, it’s time to step up and show all your creativity, and toppings are the best way to find new interesting flavor combinations! For any regular Classic Burger toppings, you can’t go wrong with grilled beefsteak tomato slices, crunchy lettuce leaves, sliced onion and melt-in your mouth mature cheddar cheese. The Country Burger, on the other hand, brings together new fresh ingredients that scream Summer: roasted red peppers, goat cheese and arugula, all seasoned with a splash of balsamic glaze. Tip: Stack toppings between the burger and bread, and you won’t end up with a soggy bun never again. Now you have all the ingredients and secret at hand for the ultimate hamburger full of flavor in every single bite. All you have to do is fire up your BBQ and get your Summer party ready! In a bowl, gently mix the beef with salt and pepper to taste. Form your patty and gently press your thumb in the center. Warm your bbq grill or a pan until medium-hot. For medium doneness, cook the burger 5 min on one side, without moving it. Flip to the other side and cook for 2 more mins. While the meat rest for a couple of mins, brush the bun halves with extra virgin olive oil and toast until lightly crisp. Place the salad into a bowl and gently season with balsamic reduction and salt and pepper to taste. Spread generously the goat cheese on one half of the bun. Add the roasted red peppers slice, onion rings and arrange the meat on top. Add the balsamic arugula and close the burger with the other half of the bun. Looks so delicious! Will give it a try. Hmmm. I love your addition of goat cheese! A fab burger!